Meal delivery services are growing in popularity and with good reason. Fresh, delicious chef cooked meals delivered to your door with you not having to lift a finger, who wouldn’t want that!? It used to be the only thing you could get delivered was a fat-filled Chinese or super heavy carbohydrate loaded pizza. 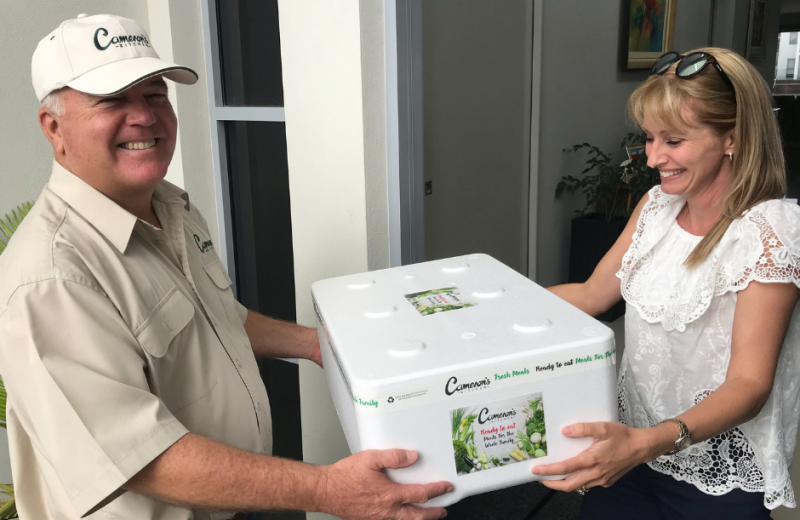 But as obesity has risen steadily with 2 out 3 Australians in 2014-2015 being overweight or obese, health-conscious entrepreneurs have stepped in to save the day, making healthy food convenient for everyone through meal delivery services. No matter whether you’re a family of five or living on your own, Cameron’s Kitchen has fresh meals to suit your lifestyle and budget. Alongside convenience, there are many other perks to having healthy meals delivered directly to your door. Shopping for the exact right amount of ingredients in your local store can be hard. It’s easy to over shop and think you need more than you do which leads to food waste. Having your meals delivered means you know exactly what you’re getting from breakfast to dinner and you won’t have ingredients going mouldy in the fridge that you just don’t know what to do with! This goes without saying that having everything delivered to your door will be way more convenient than slogging it out in the kitchen every day. Having the stress of meal preparation taken out of your life means you can make more time for the kids, go to that yoga class you’ve been meaning to attend or just take more time to relax. When cooking for yourself, do you really know the amount of nutrients in each meal and whether it’s in line with your needs and goals? Cameron’s Kitchen will clearly show you the amount of carbohydrates, protein and fats in each meal, ensuring you can stay on track to lose a few pounds or eat enough protein if you want to put on muscle. When you think of the time saved from not having to shop or cook, the petrol saved from not having to drive to the store and how much you save from not going to a restaurant, meal delivery services are a cheaper option to get chef prepared food right in your home. While some people are born with a chef’s hat on, many of us struggle to cook new dishes and will probably stick to a few easy recipes like an easy pasta or chicken and veggies. Meal delivery allows you to experience a range of delicious dishes and eat beef that isn’t stringy or tough (as sometimes happens with home cooking!) Meal delivery can open you up to foods from around the world you may never have tried, like a tasty Hungarian beef goulash or a Massaman curry. With so many dishes to choose from, you’ll never get sick of eating the same foods night in night out.